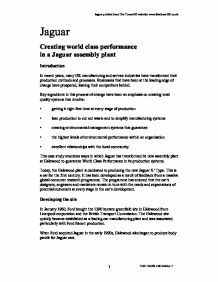 Jaguar Creating world class performance in a Jaguar assembly plant Introduction In recent years, many UK manufacturing and service industries have transformed their production methods and processes. Businesses that have been at the leading edge of change have prospered, leaving their competitors behind. Key ingredients in this process of change have been an emphasis on creating total quality systems that involve: � getting it right first time at every stage of production � lean production to cut out waste and to simplify manufacturing systems � creating environmental management systems that guarantee: � the highest levels of environmental performance within an organisation � excellent relationships with the local community. 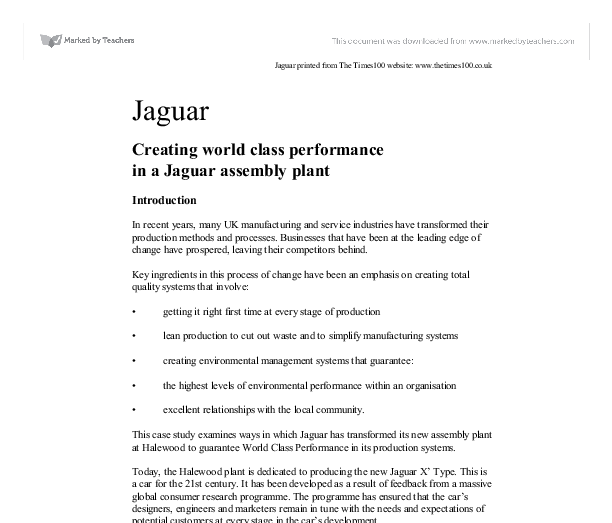 This case study examines ways in which Jaguar has transformed its new assembly plant at Halewood to guarantee World Class Performance in its production systems. Today, the Halewood plant is dedicated to producing the new Jaguar X' Type. This is a car for the 21st century. It has been developed as a result of feedback from a massive global consumer research programme. The programme has ensured that the car's designers, engineers and marketers remain in tune with the needs and expectations of potential customers at every stage in the car's development. ...read more. This involved creating consistency across the production process so that, for example, every shift would be working the same way. At the same time, emphasis was given to reducing time spent on activities that do not add value to the manufacturing process. Line operators were given responsibility for identifying continuous improvements that could be made. Operators were organised into smaller teams working with a group leader. These groups have been given considerable responsibility for identifying a need for change and then driving it through. By being given experience of production methods in Jaguar's leading edge plants in the Midlands, Halewood operators and group leaders learned more about the changes required. The Centres of Excellence pillar was seen as the key driving force in changing people's thinking. Bringing a large plant like Halewood to the required level of performance in a single leap would have been too great a task, so the concept of 'Centres of Excellence' was born. Under this, manufacturing improvement could be made first within smaller areas through close co-operation and teamwork. As the established Centres of Excellence demonstrated progress, the concept was rolled out across more and more areas, until all the Centres of Excellence linked together and standards across the whole plant were transformed. ...read more. Questions 1. Why did Jaguar choose the Halewood site to produce the 'baby Jag'? 2. Identify three major challenges that Jaguar faced in setting up its baby Jag production line at Halewood. 3. How did Jaguar go about meeting these challenges? 4. How might Jaguar evaluate the success of the changes it introduced at Halewood? 5. Why is the creation of World Class Performance essential to the success of the Jaguar plant? Glossary Centres of Excellence: Pioneering centres and groups of employees incorporating all of the latest quality initiatives, to model them for others and to encourage change within the organisation. Empowerment: Giving responsibility for making decisions to lower levels within the organisation. Flexibility: Empowerment of employees to carry out a range of processes and activities rather than having a narrow focus. Global consumer research programme: Market research to identify the requirements of potential and actual customers worldwide. Line-side: Physically next to the production line. Total quality systems: Systems operating within an organisation to ensure that quality concerns are built into every stage of production. www.thetimes100.co.uk � Answers to the questions � To download this case study � A profile of the organisation � Revision help Jaguar printed from The Times100 website: www.thetimes100.co.uk 1 THE TIMES 100 Edition 7 ...read more. The PCA oversaw all stages of production and regulated the content of studio productions. Any film released without the PCA's seal of approval was subject to a $25,000 fine. * From the Don't and be Careful's to the Hays Code * Blacklisting Questions for Discussion: What were the benefits of the Studio System for both workers and the studios themselves? Teams were composed of approximately eight members. Groups were self-managed, and the position of team leader rotated within the work group. The team leader took care of organizing daily administrative tasks. Those who wished were able to take management courses. He played his character and adapted him to be how he found him. He had a unique style of panning in out of the performance, even wavering in and out of action. Having spells of brilliance, in particular when he was arguing the Birling's innocent and the hoax inspector; followed by dormancy. Due to the time of year we were aware that it would be dark so we chose to introduce torches a both a focus device and to illuminate our performance. We improvised some stylized movements which linked the progression into the dance with the previous acting. This would therefore limit the flexibility of the production and as a result prevent organisations competing fluidly, because the products available in the market would be limited. The period of Fordism was characterised mainly by mass production and mass consumption. "There are no more than three water fountains (for over 800 workers). Sometimes there is no water in these fountains. If we are thirsty, our mouths get dried up." This mentions how serious and neglected are the conditions at Nike production plants.